Running a restaurant kitchen requires a lot of hard work, creativity and dedication. As does running the kitchen of a catering company. Here Executive Chef Peter El Hachem of Intercat Group, one of the largest catering companies in the UAE, shares his experience and reveals how new products can spark culinary creativity. Be prepared for a challenge: I have been a chef for 15 years, yet every day brings with it a different experience where I learn something new. Every day I face challenges, but I always make sure to end the day with success. Be continually creative: In catering you’re not obliged to have a standard menu or standard dishes like you would in a restaurant. You can create as many recipes as you want and continually refresh your dishes. Enjoy your ingredients: Tomato is a key ingredient for us. We consistently use it in dishes, from soups and pasta to Arabic cuisine. There’s challenges with using tomato, but there’s lots of ways to use it and that’s enjoyable. 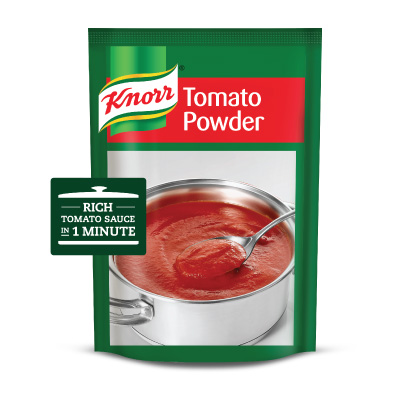 Benefit from ready-to-use products: Knorr Tomato Powder is helping us in many ways – storage, waste, no expiration once opened like canned products and good texture. It’s also inspiring us to create new dishes. Knorr Tomato Powder is produced through a process that transforms 88 tomatoes, grown on 100% sustainable farms, into dehydrated tomatoes. Just add water for a rich tomato sauce, ready in 1 minute!